(by Nolan Peterson, The Daily Signal) KYIV, Ukraine—The U.S. Coast Guard was set to hand over two of its decommissioned 110-foot armed cutters to Ukrainian President Petro Poroshenko at a ceremony Thursday in Baltimore. “The transfer of these vessels is the latest example of America’s long-standing effort to help Ukraine defend its sovereignty and territorial integrity,” Robert Karem, assistant secretary of defense for international security affairs, told The Daily Signal in an [email]. Ukraine’s navy will take possession of the two U.S. patrol boats. 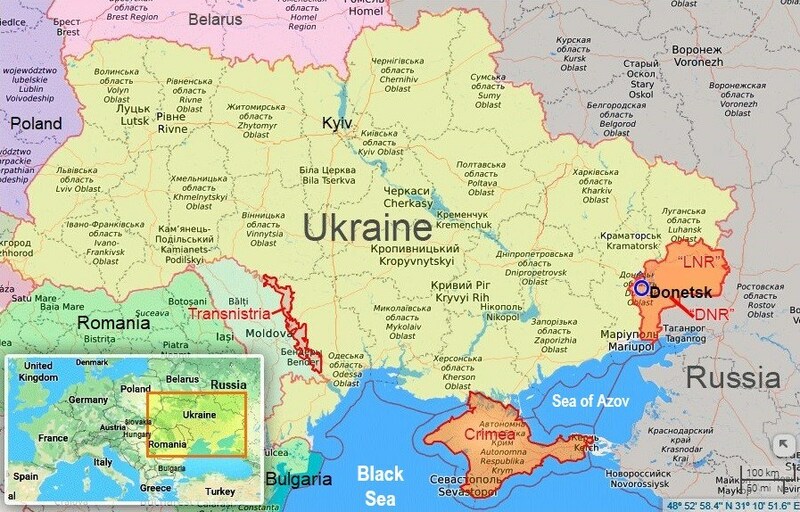 … Russia’s aggression in the Sea of Azov has spurred Ukraine to shore up its defenses against the threat of a Russian amphibious invasion from either the Sea of Azov or Black Sea. “The Kremlin has no intention to stop. Having occupied [taken control of] Crimea [from Ukraine], it now aims at occupying the Sea of Azov between Ukraine and Russia,” Poroshenko said to the United Nations General Assembly on Wednesday. The Russian harassment operations became so pervasive that by July many Ukrainian and American officials said it was tantamount to a blockade. For its part, Moscow denies any wrongdoing and claims it has a legal right to conduct such naval operations to defend its “exclusive economic zone” in Crimea. The twin American Island-class cutters due for delivery to Kyiv—the Drummond and the Cushing—are typically armed with a 25 mm machine gun, two .50-caliber machine guns, and other small arms. The U.S. Coast Guard used the patrol boats for myriad operations, including drug interdiction missions. The Coast Guard cutters will undergo an extensive five-month refurbishment at the Coast Guard yard in Baltimore, Pentagon spokesman Eric Pahon told The Daily Signal. 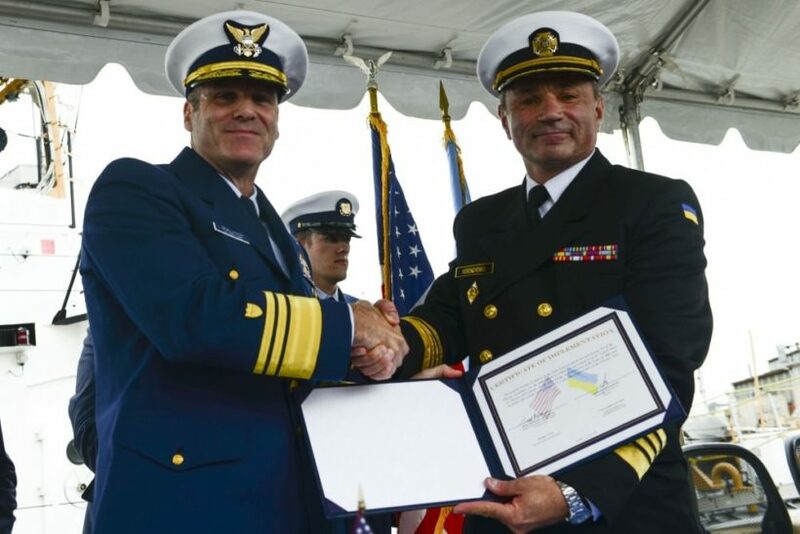 Following this refurbishment, the Coast Guard will provide approximately three months of training, including at sea, for two Ukrainian crews totaling about 35 sailors. Williamson said the move was meant to help train the Ukrainian military as well as to build up its naval forces, British agencies reported. The defense secretary also said the U.K. would conduct more naval patrols in the Black Sea in 2019. Published at The Daily Signal on September 27. Nolan Peterson, a former special operations pilot and a combat veteran of Iraq and Afghanistan, is The Daily Signal’s foreign correspondent based in Ukraine. NOTE: Before answering the questions below, read the info under “Background” and “Resources” below. b) Describe the latest aggression from Russia against Ukraine that began in April. c) What additional support is the U.S. giving Ukraine following the hand-over of the two decommissioned cutters? d) What steps is the UK taking as its part of the NATO effort to build up Ukraine’s maritime defenses? What is the purpose of these actions? CHALLENGE: Between Feb-March 2014, Russia annexed (forcefully seized control of) the Ukraine’s Crimea region. Read the remainder of this article (which is posted under “Background” below) for a better understanding of the challenges Ukraine faces in defending itself against the aggressions of Russia. Ukraine and Russia are already at war along a 250-mile-long, entrenched front line in Ukraine’s southeastern Donbas region. There, for four and a half years Ukrainian forces have been in daily combat against a combined force of Russian regulars, Russian-backed separatists, and foreign mercenaries. Despite a 2015 cease-fire, known as Minsk II, the war stills simmers with daily shelling and small arms gunfights. Last week alone, international cease-fire monitors recorded more than 5,500 cease-fire violations along the Donbas front line. Each violation, it should be said, does not comprise a single shot fired but can comprise an artillery barrage or a gun battle. Beginning in July, President Poroshenko kick-started a plan to build up Ukraine’s naval strength and harden its coastal borders. Ukraine has since announced the creation of a new Marine brigade to defend its southern coastlines. And on Sept. 17, Kyiv unveiled a plan to stand up a new naval base on the Sea of Azov to “repel the aggressive actions in the region by the Russian Federation,” Kyiv said in a statement. The only way for ship traffic to enter the Sea of Azov is from the Black Sea through the Kerch Strait. In May, Russia opened a bridge over the Kerch Strait chokepoint. True to form, Russian President Vladimir Putin drove a big rig over the new bridge to mark the unveiling. The bridge created a land transportation route from mainland Russia to Crimea, the Ukrainian peninsula that Russia invaded and annexed in 2014. Prior to the bridge’s opening, land traffic could only enter Crimea through Ukrainian territory. For one, the bridge was too low—some Ukrainian vessels have had to cut down their radio antennas to pass under it. More of a concern for Kyiv, however, was the uptick in Russian harassment against Ukrainian ships passing under the bridge. Once through the Kerch Strait, the two Ukrainian navy ships were met by a pair of armored Ukrainian Gyurza-M class gunboats, the Kremenchuk and the Lubny, which served as escorts. On Sept. 25, the four vessels steamed into the Ukrainian port of Mariupol. The whole exercise underscored the burgeoning crisis between the two erstwhile Soviet allies over the right of free movement through the Sea of Azov. It was also a public relations victory for Ukraine. News of the Ukrainian ships’ Kerch Strait crossing lit up across Ukrainian social media throughout the week. Ukraine has also embarked on a diplomatic push to shed light on Russia’s aggression in the Sea of Azov. Speaking before the U.N. General Assembly on Wednesday, Poroshenko called for more Western sanctions on Russia for its aggression in the Sea of Azov. Ukrainian and Western military experts alike worry that tensions in the Sea of Azov could widen or escalate the ongoing land war in the Donbas. Read a June article “Moscow blocking maritime shipping to Ukrainian ports on Sea of Azov” from Euromaidan Press (EP). EP is an online English-language independent newspaper launched in 2014 by Ukrainian volunteers. EP focuses on events covering Ukraine and provides translations of Ukrainian news and expert analysis as well as independent research. Through its work, EP strives to bridge Ukraine with the English-speaking world.